Making connection via VPN is one of the best ways to stay both private and secure online. We all know that a great way to protect your privacy is to carry out all of your internet activity while connected to a VPN and none more so than when accessing through public wi-fi services. One big use for VPN services is that of torrent access where users aim to protect themselves from copyright infringement notices and regardless of the legalities of that or the morality it definitely is a widely used purpose. Although my personal experience has only ever seen connection drop unexpectedly on a rare occasion, depending on what VPN protocol you use and how good the quality of your connection is can play a large part in how reliable your connection is. I’m lucky to have an extremely reliable main internet connection and can leave my VPN connected almost permanently securing the privacy of my connection. When travelling and accessing a VPN service via my mobile phone the reliability of the connection is less impressive especially when travelling long distance by train or other transport for example where the signal can drop through tunnels or for whatever other terrain reason. While VPN connections on reliable internet connections are rather robust there are occasions where VPN servers can go down for a variety of reasons either unexpectedly or due to provider maintenance. While most providers do try and issue warnings when they are working on servers this is usually done via notices on their websites and so every user may not be initially aware that a server will be going offline at a specific time. When either of these situations arise either from a poor internet connection or from provider maintenance the result will be that your connection will drop and you will suddenly be thrust back on to the unsecured connection of your internet service provider. The whole idea of a VPN connection is to secure your connection and the result of a connection unexpectedly dropping will be that any data that you are transmitting or receiving via the VPN connection will now be transmitted via your normal internet connection. Depending on your usage this can result in a minor annoyance to a more severe issue. For those who are using a VPN service to torrent if your connection dropped then your torrent downloads would continue on your normal connection and for those using the service to avoid receiving notices of copyright infringement and possible internet disconnection (which is possible in countries like the US) this could open up a large can of worms that you were originally hoping to avoid by employing the services of a VPN provider. With the possibility of exposing what you hoped would be encrypted via the VPN it is important when doing security critical tasks to make use of some sort of kill switch. Many VPN providers offer this sort of service built in to their custom software, although not all and those who make direct connection either via PPTP, L2TP/IPSec or OpenVPN won’t have that type of ability built in either. A kill switch is a way of killing your internet connection should the VPN disconnect protecting your privacy and security. I recently came across a basic but very effective kill switch solution for Windows that works across the range of VPN protocols and is extremely easy to use. 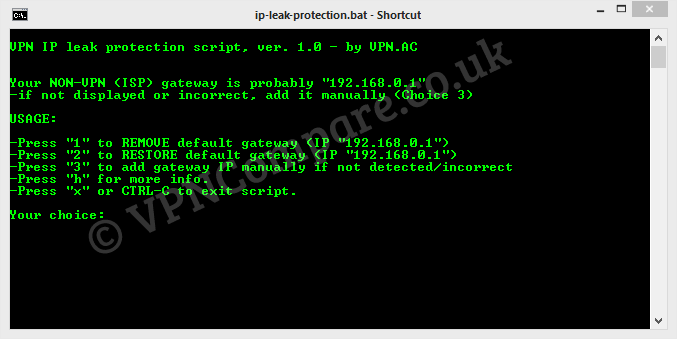 Bundled with the VPN.ac software is a simple .bat script which opens a shell window and allows you to remove your default gateway thus in essence turning off your normal internet connection. If a VPN connection should drop it would render your internet basically dead allowing you the ability to stop any privacy related software before re-enabling your standard internet connection. Next connect to the VPN provider of your choice via whatever method you wish be it a direct connection using OpenVPN, PPTP, L2TP or even your providers own custom software. Next double click ip-lead-protection.bat. You’ll need to give permission for the file to make changes, if you have issues, run the file as an administrator. Once you’re connected to your VPN server simply press 1 to enable your kill switch which will disable your standard internet connection meaning if your VPN connection should drop your internet connection will be dead which will remove any possibility to leak data outside of the VPN connection. To re-enable your internet connection either before or after manual or unexpected disconnection simply press 2 inside the window, this will disable the kill switch. There really is nothing more to it, a simple and effective kill switch solution no matter which VPN service or protocol you make use of. If you don’t already have a VPN provider don’t forget to show VPN.ac some love by signing up to their service, not only did they create this simple but effective kill switch but they also provide a pretty mean VPN service too! Thanks, Christopher! This is exactly what I was looking for. Simple, clean, and it works perfectly fine. Not a year ago. How’s the killswitch built into LiquidVPN software? Ahh didn’t see the date. It uses Windows Packet Filtering. If you enable it and then look at your Windows firewall you will see all the rules it writes.